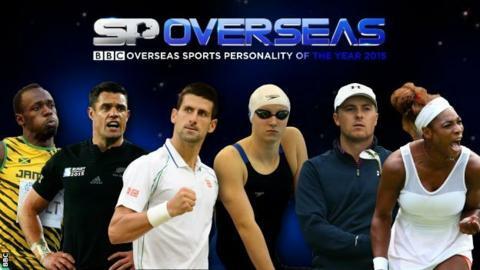 Voting has now closed for the BBC's Overseas Sports Personality of the Year 2015. The award recognises the overseas athlete who has made the most substantial contribution to sport this year and, for the first time in its history, is decided by a public vote. And if you missed out on this vote, you can still register for a BBC iD now which will let you cast your vote for the main Sports Personality of the Year award on Sunday, 20 December. The Overseas winner will be announced ahead of the main awards show in Belfast. Did you know? Bolt has won the Overseas award three times - a record he holds with tennis star Roger Federer and boxing legend Muhammad Ali. What they said: "Usain Bolt was challenged in Beijing more than he has been at any time during his career. Put on top of that the burden of 'saving the sport' which was placed on his shoulders, it means that the pressure was there. I have to give him so much credit for his performance." Eight-time world champion Michael Johnson. Did you know? Carter is rugby's all-time leading points scorer, with 1,598 from his 112 Tests. What they said: "Dan Carter will be number one in the pantheon. Clearly number one." Australia's World Cup-winning outside-half Stephen Larkham, when asked who is the greatest ever fly-half. Achievements in 2015: It has been the most successful year to date for the world number one in tennis, with victories at the Australian Open, Wimbledon and the US Open. He also reached the final of the French Open. Did you know? Djokovic was spotted as a six-year-old by former Yugoslav tennis player Jelena Gencic at Mount Kopaonik, where Djokovic's parents ran a fast-food restaurant. What they said: "As a single season, I think Djokovic's is the best since Rod Laver in 1969." Former French Open men's doubles winner Patrick McEnroe compares Djokovic's achievements with those of Laver, who won the calendar-year Grand Slam in 1969. Did you know? Ledecky became the first swimmer to win L'Equipe newspaper's Champion of Champions award in 2014. Previous winners include Serena Williams, Michael Jordan, Tiger Woods, Usain Bolt and Lionel Messi. What they said: "Every time Katie gets in the water [it's like] 'hey, we'll just give the world record a shot tonight'. Why not? It doesn't even look like she's breathing hard. It's just unbelievable." American swimmer Michael Phelps, who is the most decorated Olympian of all time. Did you know? Spieth became the youngest winner of the US Open since Bobby Jones in 1923. What they said: "He's a grizzled veteran at 21 years old. Jordan is so beyond his years. I like everything about the young man. He's polite. He's humble. He handles himself so well, on and off the golf course. And he's obviously a wonderful player." Jack Nicklaus, who holds the record for the most major victories (18). Did you know? Serena Williams has been ranked as the world number one for 268 weeks - only Graf (377) and Martina Navratilova (332) have spent longer at the top of the rankings. What they said: "Serena is the greatest to ever play the game when she is on [form]. Martina Navratilova would try to do something that people don't do, which would be to attack her. I would say she wouldn't have a lot of success. If they played 10 times, maybe she could win a couple. I think it would be tough to win a majority for sure." Tennis legend John McEnroe discusses who would win if Serena Williams and Martina Navratilova played each other at their peaks. Who put together this shortlist? Carl Doran (Sports Personality of the Year executive editor).